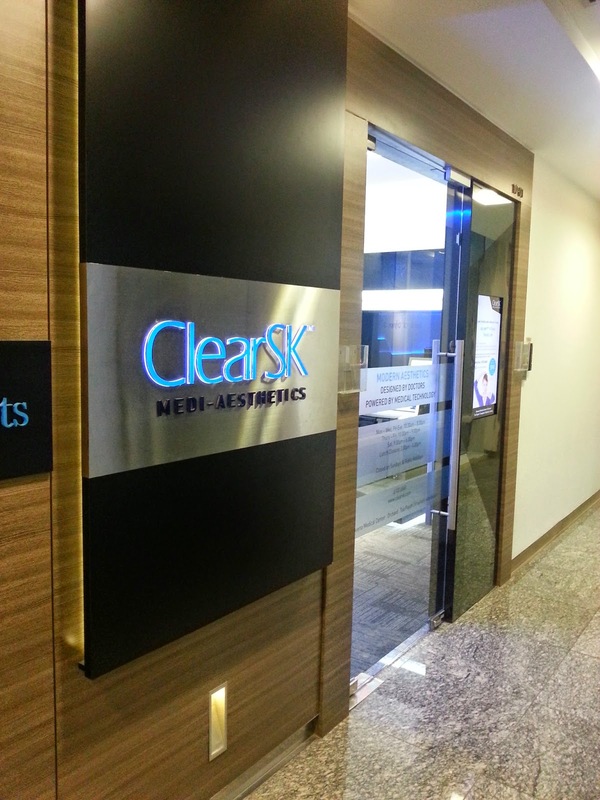 Previously, I've blogged about ClearSK's Aqua Acne Clear Renewal Facial and this time round, I've returned to ClearSK at Novena Medical Centre to try out their Hydrabright Lazer Facial treament! Meant to be a comfortable and pampering skin whitening treatment, the Hydrabright Lazer Facial first started off with the cosmetic lazer treatment, which uses LHE (Light and Heat Energy) to keep the skin supple and rejuvenated. The LHE also helps to brighten the skin tone and lighten pigmented skin conditions, such as acne marks and mild pigments. Resembling something like IPL, the handheld machine emits a very bright light (my eyes were covered by a layer of cloth but I could still see bright flashes with my eyes closed) when held against my skin and I could feel heat, which varies from mild to a little too hot for comfort (but still bearable) at different parts of my face. There's also a burning smell as the heat burns off my facial hair, which is normal. And after the LHE session, we moved on to a Japanese technology of Iontophoresis to break down pigments without damaging the skin. Light ultrasonic waves are first passed over the skin for gentle exfoliation before ascorbic and other antioxidants are applied onto the skin and a gentle current passed using an electrode creates an electrical gradient to propel the pure ascorbyl phosphate solution into the pores. It does sound a little painful to pass electricity through our skin, but it's actually pretty painless, just a dull numbing/vibrating sensation as the equipment slides around my face. After that, a light ultrasonic infusion of Vitamin C moisturiser was applied before a layer of facial masque was applied on for 15 minutes to lock in all the active ingredients. Though the improvement are not drastic, you can still see that the overall texture of my skin has improved just with 1 treatment (especially at the area below my eyes and right above my cheekbones) and my skin also got brighter. I always enjoy getting a facial especially if it's non-invasive. I feel refreshed afterwards and there's a light feeling. I guess, the change, though not drastic, is not just on the outward appearance but also within. Is LAZER a laser? Why do they spell it with a Z? Laser is a knife so the operator needs to be licensed dermatologist physician, not a mere technician. it's LHE (light heat energy) which is similar to laser. I'm guessing it's intentional (spelling it with a Z instead of S). I love how this works. Your skin looks brighter and the pores are less visible. I would love to try this. Well, other women won't discover this kind of facial skin treatment but they prefer the daily care instead. But this is great once in a while to be serviced. Laser Facial is good for making our skin clean and healthy. But do not be hook with it, because too much of it might destroy your skin. I'm sure the results would even be better after several treatments. This would surely give you a better skin. Your geeky glasses' so cute! Can't wait to see the results after several more times! Your skin is looking better and quite clear but I am bit afraid to try any of the treatment these days. Some more treatments and your skin will definitely looks more brighter. I'm glad that you noticed the positive change for your skin with your first treatment. This only proves that the treatment really works. Such treatments do take time buy I see that your pores have reduced in just one treatment which is awesome!